Lowell Elementary students work on tasks designed to introduce them to coding. The brightest young minds destined to fill future jobs in coding can be found in an elementary school classroom near you, and St. Scholastica students are helping those kids discover their abilities and interests in a fast-growing field. As part of the annual "Hour of Code" event, which caps off Computer Science Education Week each December, five St. Scholastica computer science majors worked with kindergarteners and third graders at Lowell Elementary. "I enjoyed watching the third-grade students working through the game coding challenges, and helping each other when they got stuck," said Hope Haugstad, a computer information systems major. "Getting kids interested in tech at a young age opens their minds to the possibilities of STEM careers." The third-graders worked on a computer coding activity that uses a video programming language, visual building blocks and a drag-and-drop interface. This creates an easy, user-friendly introduction to the logic and language of coding. Students worked on a tutorial featuring the current Disney hit movie, Moana. The kindergartners didn't even need computers for their activity, which introduced them to programming and computational thinking through an "Ozobot." Students programmed this simple robot to follow a rudimentary map drawn on a piece of paper with markers. Associate CIS professor Tom Gibbons said both activities were very engaging, inspiring a new generation of coders. "The kids were very excited about it, and our students really enjoyed it," Gibbons said. Haugstad said that the students gained much more than just a firsthand exposure to the world of coding. "Working through algorithms and problems are life skills that transfer to all areas of a well-rounded adult," she said. "I want to teach someday, so opportunities such as this are wonderful!" The goal of the Hour of Code program is to give students some early hands-on experience in computer science, in response to the high-tech workforce needs of tomorrow. It's an accessible way to show that anyone can learn code. The effort has grown into a worldwide initiative. "It's good to go out there and try to encourage it, and just get them interested in it," Gibbons said. 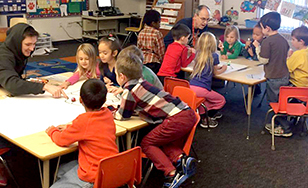 The partnership at Lowell Elementary was organized in part by maurices Senior Human Resources Manager Amy Lundberg, who sees firsthand the need for experienced, skilled coders in today's workplace. "We appreciate that Professor Gibbons and his computer science students from St. Scholastica brought such fun technology and expertise to our Hour of Code!" Lundberg said. Participating students included Anja Kadijevic, Hailey Vold, Karli Niemann, John Donlan and Haugstad.